Dando continuidade aos nossos posts sobre Voice Mail no Office 365, veremos agora como conectar o Lync ao Exchange Online! If you are running Microsoft Office Communications Server 2007 (or 2007 R2) for enterprise voice, you must upgrade to Microsoft Lync Server 2010 before you can connect to Exchange Online UM. If you are running other PBXs or IP PBXs for your telephony solution, please refer to the section titled Connecting Telephony Solutions to Exchange Online UM (page 8). When used for Enterprise Voice, Microsoft Lync Server fulfills the role of the telephony solution on the customer’s premises. Lync provides Exchange Online UM with the call processing that UM needs. Figure 2 shows a simplified view of a typical arrangement with Microsoft Lync Server on the customer’s premises, connected to Exchange Online UM through a public IP network. The major difference from an arrangement in which the customer is also running Exchange on their premises is that the customer must deploy at least one Lync Edge Server role. A Lync Edge server acts as the VoIP-aware network border element (compare Figure 1). It relays the VoIP traffic to and from the public network, and provides protection against threats from malicious users on that network. 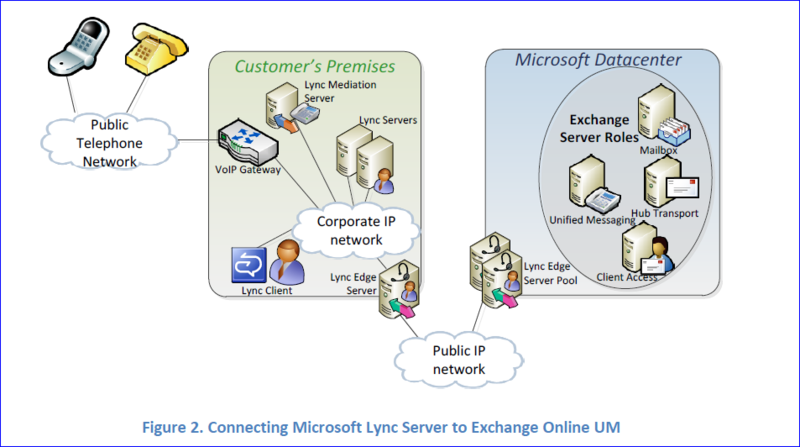 Customers may need to deploy one or more Lync Edge Servers even if they have not been using Exchange Online UM. They do this to support Lync users outside the corporate network who wish to access Lync for presence, instant messaging or audio/video services. The Microsoft Datacenter also contains Lync Edge Servers. These provide the corresponding relay and protection functions on behalf of Lync customers who use Exchange Online UM for voice mail. The Lync documentation on TechNet contains an article titled Providing Lync Server 2010 Users Voice Mail on Hosted Exchange UM that complements the advice in this document. In particular, the link to the article titled Configure the Edge Server for Integration with Hosted Exchange UM provides essential information on creating a Hosting Provider object, which is required for the remainder of the Lync configuration to work correctly. Microsoft Lync 2010 Server introduces Hosted Voice Mail Policies. A Hosted Voice Mail Policy is a configuration object that tells Lync whether a user or contact has corresponding Exchange Online UM service and, if so, how to contact it. A single, global Hosted Voice Mail Policy is created when Lync is installed. If a customer needs finer-grained control of hosted voice mail, they can create additional Hosted Voice Mail Policy objects (see the relevant Lync documentation for details), but many customers will find that the global Hosted Voice Mail Policy (already created) is sufficient for their needs. Com experiência de 13 anos no mercado de TI, sendo 7 anos focado em serviços de nuvem, hoje ajudo clientes no entendimento e adoção das estratégias de nuvem Microsoft na REDBELT. Reconhecido pela Microsoft como Most Valuable Professional (MVP) de Office 365 e P-Seller LATAM Winner 2017, sou um líder com o compromisso de ajudar pessoas a obterem o máximo de suas experiências com as tecnologias Microsoft. Uso minhas habilidades de comunicação e criatividade na busca de soluções reais para os clientes e desenvolvimento do time interno. Conhecimentos sólidos na área de atuação ajudando os clientes em tomadas de decisão, elaboração de cenários, técnico e financeiro, sempre orientado a obter resultados para os negócios comprometido com as necessidades dos clientes. Publicado em 17/04/2011, em Office 365. Adicione o link aos favoritos. Deixe um comentário. Clique no botão "Seguir" e receba as informações do Office365 Blog por e-mail.